Amaranth is highly vitamin-rich and is a good source of vitamin A, vitamin B6, vitamin K, vitamin C, folate and riboflavin. Amaranth includes numerous minerals such as calcium, potassium, iron, copper, magnesium, phosphorus and especially manganese. Amaranth contains large amounts of protein, up to 30% more than wheat flour, rice and oats. The protein contained in amaranth is also unusually complete when compared to other plant sources, containing a complete set of amino acids. Therefore, different sources to obtain the daily recommended dose of protein is not needed. Also, amaranth lacks gluten, which is a problematic protein contained in many true grains. Dietary fiber and essential amino acids, including lysine which has clinically shown potential for cancer treatment, are prominent in amaranth. It also contains relatively low cholesterol levels. Grain amaranth is very palatable and is easy to cook and include in snacks and dishes. Amaranth is grown and consumed as a leafy vegetable in many countries around the world. It is commonly boiled, steamed, or included in soups and stir-frys. Cooked amaranth is 90% digestible. 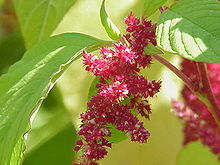 The oils in amaranth have been shown to help prevent and treat those with hypertension and cardiovascular disease. Regular consumption of amaranth can reduce cholesterol levels and lower blood pressure. Some research has even shown that grain amaranth shows promise in prevention of premature graying of the hair. Amaranth’s moderately high content of oxalic acid inhibits much of the absorption of calcium and zinc. It should be avoided or eaten in moderation by those with gout, kidney disorders or rheumatoid arthritis. Reheating cooked amaranth is not recommended, particularly for consumption by young children, because the nitrates in the leaves can be converted to nitrites, as in spinach.